Immigrant and survivor Anna Wang offers a unique glimpse into the Tiananmen Square Incident and the China surrounding it in her powerful new book Inconvenient Memories: A Personal Account of the Tiananmen Square Incident and the China Before and After. From her childhood account of living in an oppressed government system, to the activities during her college-age years that led to the protests in the Square and beyond, Wang’s revealing personal account is both gripping and terrifying. It’s a story that will never be allowed to be told in her home country. Having experienced students’ protests while studying at Peking University, Wang naturally felt for the cause of the students. However, as an employee of a foreign enterprise, she observed the protests with mixed feelings. 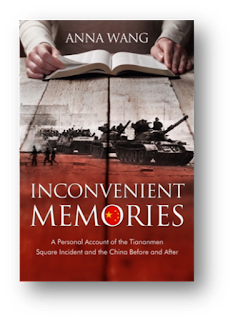 Then the massacre occurred and Wang lived through the terrifying time when tanks were in the streets and people were dying. Every relationship around her was challenged.